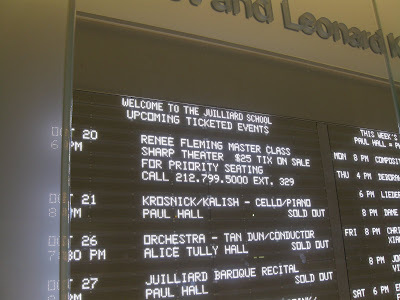 We attended Renée Fleming's first public master class at Julliard. It was also the re-dedication of newly renovated The Peter Jay Sharp Theater. 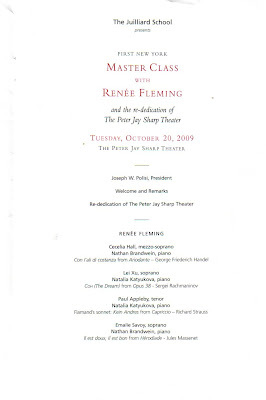 Renée has been teaching master classes around the world, even in South Africa earlier this summer, but this was her first public class in New York City. Renée shared stories of her time at Julliard and things that she's learned along the way. She told a tale or two about silly things that have happened to her on the stage. Most recently, on opening night of Der Rosenkavalier this season, she had her petticoat on backwards under her dress in Act III. Four students performed: Cecelia Hall, mezzo-soprano, sang Con I'ali di costanza from Handel's Ariodante; Lei Xu, soprano, sang Rachmaninov's COH (The Dream) from Opus 38; Paul Appleby, tenor, sang Flamand's sonnet: Kein Andres from Strauss' Capriccio; and, Emalie Savoy, soprano, sang Il est doux, il est bon from Massenet's Herodiade. After each performance, Renée spent time teaching them tips and tricks and adjusting their techniques. She said that the thing with these Julliard students is that they are already so good that there isn't much to adjust. The thing in common that all four did need was adjustment in their breathing technique. She told Paul, "The voice is on a solid cushion of air, but should be connected with the body." She stressed engaging the body so the voice doesn't collapse. She taught the technique of bending over while breathing so you could feel the diaphragm and intercostal muscles. As little as these students needed, it was so interesting to hear the difference when they tried again with just the tiniest of adjustments. 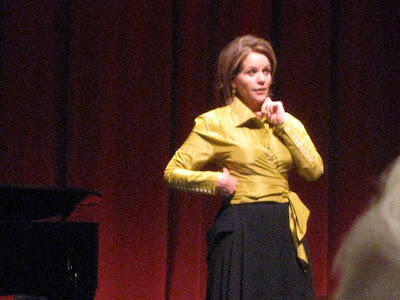 About Con I'ali di costanza from Handel's Ariodante, she said she called Susan Graham and Joyce DiDonato since this is not in her repertoire. Susan said, "This is the hardest aria ever composed for any voice." No pressure there! She encouraged Cecelia to not worry about pitches, just "sing out Louise." She told her to throw caution to the wind and that it would be more interesting even if she misses a few notes and it's not perfect. And it was. She worked mostly with Xiu on breathing. 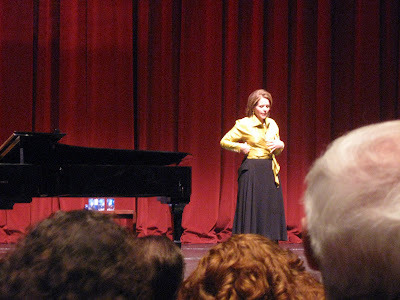 She had a beautiful, clear soprano voice and the Rachmoninov was very high. She encouraged her to add color, not to "change choice, just add to it." She further said, "When you're really doing well, you don't even think you're singing any more." Paul's performance of the Kein Andres was terrific. After he sang the opening, he looked at her and she responded as the Countess, which earned a big laugh. He continued on - he has a gorgeous, full tenor voice. She encouraged him to make a statement, be forthright with the text, and not sing it "art-songy". She said, "Too musical can be just singing to yourself." She also worked with him on breathing technique. They saved the best for last with Emaile and her BIG aria from Herodiade. She is already amazing. Renée said, "I love the color in her voice. I would recognize it in a heartbeat, even in a bar." She encouraged her to slow down and let go of singing in one position. She said, "You're too young to have mannerisms - that comes with age and experience," which earned a big laugh as she most certainly had her tongue planted firmly in her cheek. She said a big note doesn't have to be loud but should resonate and be rich. Further, "It takes a tremendous amount of courage and trust to sing pianissimo." She said she still struggles with this at the end of Act 1 of Rosenkavalier. I am very excited about the prospect of hearing these students perform some day, hopefully soon, when they are professionals. I love hearing Renée speak almost as much as I love hearing her sing. She's so smart and quite the card. She's also one of the most generous people I know. After the event, Noah and I went to the reception where I thanked Renée. She asked me if I enjoyed it and I said of course, and that what I learned only enhanced my appreciation for the artists.